It’s time for another one of Miketendo64’s Switch & Tell articles. First of all I was tasked to talk your ear off about Dragon’s Dogma, and now I am going to do the same today with Final Fantasy XII. Be warned, my love for this game is infectious, and it may just leave you wanting to try this one out when it makes its way to the Switch. Final Fantasy XII was a game that was largely forgotten when it released on the PlayStation 2 back in 2006. Well, by forgotten, I mean that it got nowhere near the buzz of previous entries in the Final Fantasy franchise. It released the same year that the PlayStation 3 was releasing, so a lot of people were more focused on the new thing coming on the horizon, rather than the incredible machine they already had in their homes. Not only that, the Xbox 360 was already out, so a lot of people had already moved on from the generation, leaving less of a player base to buy into a mainline Final Fantasy on “last gen hardware”. Upon release, the reaction from fans who did play it was very mixed. The combat system was completely different from that Final Fantasy fans were accustomed to. No more was the traditional turn-based combat, instead replaced with a semi-real time battle system. Gone were random encounters, instead replaced with the enemies actually wandering the environments. Because of this, you could pick and choose your battles, which was one change that most fans were high on. The main point of contention though was the gambit system, which was essentially player dictated AI. When you engaged in combat, the game would play itself in a sense, without you having to select a combat option, cast a spell, or do anything really. The gambit system was one you could tweak yourself with a bunch of “if blank, then blank” sentences to tell the AI what to do in certain situations. For instance, if you wanted every character in the party to attack the same enemy as each other every battle, then you would enter the option “if party member attacks enemy, then attack same enemy as party leader”. Want to set up heals on low health? Then you would go with “If party member health < 30%, then use Cura”, or something to that effect. You can also program characters to use items, and well, pretty much anything. Because of this, people claimed that the game was too easy, reducing battles to you just running up to encounters then putting your controller down as the battle plays out itself. And yes, for the most part, you can do that if you choose, but if you become reliant on it then you will come unstuck later into the game. The boss battles become intense chess matches, much like bosses from previous entries in the series. If you have been relying on the game to play itself the whole time, then these bosses will completely maul you, forcing you to actually play the game. This was perceived as a ‘difficulty spike’, which honestly was built more around people’s laziness to engage with the combat system, rather than one that breaks the game. Something people didn’t seem to realise at the time was that you didn’t necessarily have to engage with the gambit system at all if you chose. You could instead set it that when a character is ready to attack, the game will pause to allow you to select the move you would like to do. Playing the game this way brought it more in line with the classic games, just with a focus on battle positioning added in. If you mix the two battle styles together, then the game’s combat becomes a lot of fun and makes it one of the highlights of the game. Then there is the story. This one is back to the ‘fantasy meets futuristic’ style of the older games in the franchise, which was a welcome change from the direction the previous three mainline games were headed (counting XI as a mainline game). The story is wild, and seems to have a clear Star Wars influence. In fact, the whole story is essentially Star Wars, except set in the Final Fantasy universe. This was one of the reasons I fell in love with the game, as at the time it felt like a blend of my two favourite franchises. The main area you see this is with the characters. You have the princess who is on a mission to take down a world conquering evil empire, the charmingly witty and confident sky pirate, the sky pirate’s humanoid animal creature and co-pilot, the knight who has left his order and has returned to help out the princess in need. The comparisons are uncanny, to say the least, but it is done so well that it feels more like a homage than a blatant rip-off. Speaking of the characters, they are all excellent (bar one), with intriguing back stories that play out over the course of your journey. That said, there is one character in particular that makes playing this game a must, and that character is Balthier. Balthier is essentially Han Solo, and easily the strongest personality of anyone in the Final Fantasy franchise. He is a dodgy sky pirate, but behind that exterior lies a man with a lot of heart. His interactions are some of the highest points of the entire game, and even the Final Fantasy series as a whole. He is funny, charming, has a great design and is just generally a lovable scoundrel. Artistically, the style of the game is striking, with beautiful vistas to explore, massive cities bustling with people wandering the streets, ruined buildings from ancient times, everything is just visually stunning. It all comes together to help create the sense that this is a lived-in world, and that your actions are meaningful in stopping the threat that looms over Ivalice. That name should sound familiar to some, as yes, Final Fantasy XII takes place in the same setting as Final Fantasy Tactics. This helps to bring great synergy with this game to the earlier era of Final Fantasy titles, as some place names and other things will bring back some nostalgic memories. The game isn’t without its flaws, though no game is perfect. As far as protagonists go, Vaan is not the best. His storyline is flimsy at best, and his reasoning for being on this adventure is confusing to say the least. Why is he here? Well, apparently they needed a spiky-haired protagonist to be in line with previous entries, so Vaan was tacked on to play that role. I honestly didn’t find him as offensive as most people seemed to, but his inclusion in the story is admittedly somewhat weak. Speaking of the story, about midway through development, Yaumi Matsumo (of Final Fantasy Tactics fame) was forced to leave the project due to health reasons, so the story has a tonal shift that is quite jarring for some. I didn’t really notice the change, but it seems many were sensitive to it. Overall, if you are one of the many people who never picked up Final Fantasy XII, I highly recommend giving this one a chance. 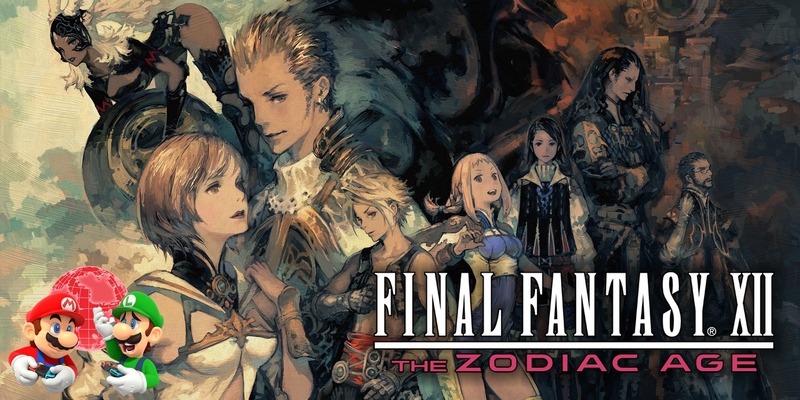 For the longest time, I considered this to be not just my favourite Final Fantasy game, but my favourite game of all time. I myself am very excited to play this one again to see if it maintains a hold on that top spot on my favourite games list, though judging from the screenshots and video footage, it may have a good chance of doing so. The game looks beautiful on Switch and has some quality of life additions, such as the ability to speed up the game to make grinding an absolute breeze. If you are on the fence, I personally feel that this one will definitely be worth checking out.